A successful businessman has to get to Cape Town in five days for his father's funeral, and to take over his father's company. However he has to complete certain tasks on his way down to Cape Town, and the only way he can do that is to take a road trip with a free-spirited young woman. As per usual for road movies, they have assorted adventures along the way with the quirky people they meet, until a dark shadow is cast over their future. In Afrikaans language with English subtitles. 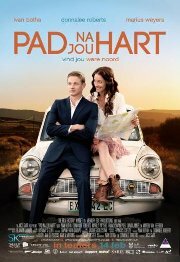 Adventure, Comedy, Romance, Afrikaans, South African.